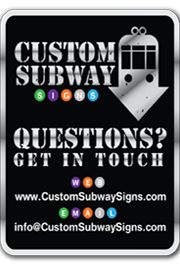 Add a vintage feel to your home or office with a replica 1950's and 60's Tram, Bus & subway destination signs. These unique destination art pieces are carefully designed to recreate as closely as possible the original signs from the fronts of old trams and buses from around the world. Our original destination tram and bus art series are stunning typographic canvas prints that can also be customised to tell your very own story.